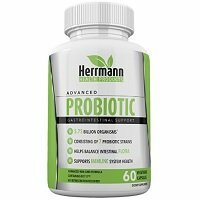 I give Herrmann Health Products Advanced Probiotic 1 out of 5 stars. Needless to say, I don’t like this probiotic at all. The directions say to take 1 capsule, 1-3x daily, with a meal. The capsules were average size but they seem harder to swallow for some reason. More importantly, I saw absolutely no changes in my symptoms, even when I took the maximum amount daily of 3. It didn’t matter how many capsules I took per day I still saw no improvement. I felt like the capsules were just sugar pills or sawdust. There’s also no guarantee for this product, so don’t waste your money on it. There’s not even an active website. It just says it’s “under construction” and redirects you to their Amazon page. It makes me worry that the company doesn’t have an active website up. The formula also doesn’t contain a prebiotic, which is a bummer. Overall, I’m very let down with this probiotic and don’t like it at all. Herrmann Health Products Advanced Probiotic has 5.75 billion CFU in 7 probiotic strains. I like one strain used, which is Bifidobacterium longum. That strain may have anti-inflammatory effects on the body. This may also help boost your immune function. One strain I actually don’t like that’s in here is Lactobacillus casei. That strain has been shown to be rather aggressive and can overrun other good bacteria in the body. Herrmann Health Products Advanced Probiotic doesn’t seem to have any allergy concerns. It doesn’t list anything, at least. However, manufactured and packaged in a facility which may also process wheat, soy, fish, crustacean shellfish, peanuts, tree nuts, eggs, and milk. So if you’re very allergic, be careful with this one and opt for another supplement that’s 100% hypoallergenic. The other ingredients include: vegetable cellulose, maltodextrin, and medium chain triglycerides. It costs $14.95 for 60 capsules, which can last 20 to 60 days depending on how many you take. The price per day ranges from $0.25 to $0.75. 25 cents is SO cheap and even 75 cents is about average. You get what you pay for in my opinion. I think this is a very low quality product. I suggest saving your money and using it on a better quality probiotic. I didn’t see any negative side effects while taking this probiotic. However, I also didn’t see ANY positive side effects. I literally felt ZERO difference. Also, I was doing some research and some users experienced BAD side effects. These included incredibly painful stomach cramps, nausea, gas, and headaches. Be careful if you’re sensitive and make sure you take as instructed (with a meal). The Herrmann Health website is “under construction” but I have a feeling it’s not going to go up live any time soon. The links just redirect you to their Amazon.com page. I really don’t like when companies don’t have an actual website. It makes me uneasy and question them more. Regardless, they don’t have any type of guarantee, which is very disappointing and yet another concern. A company needs to stand behind their product. To buy Herrmann Health Products Advanced Probiotic, click here.